Schubert -Liszt. Der Muller und der Bach. Erlkonig.Litanie. Fruhlingsglaube. Der Doppelgaenger. Aufenthalt. 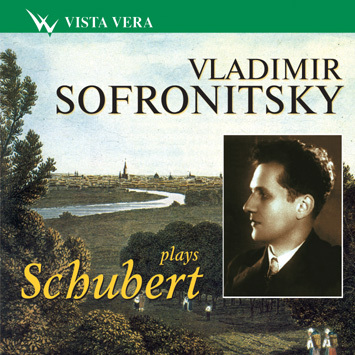 Sofronitsky (1901-61) has been variably and erratically served by record companies. But Vista Vera has now entered the market with its own contribution. Let's hope a comprehensive edition is not too unrealistic a hope. Here his playing spans the years 1953-60. The C minor Impromptu from D899 is full of drama and extravagant rubati, its contours etched with exaggerated intensity, whilst the A flat major (D935 No.2) is quixotic indeed, with slow and fast tempi stretching the piece almost - but not quite - to breaking point. The G flat major is, to my ears, more Chopin then Schubert and amongst the slowest performances I've heard. The Moments Musicaux were recorded in 1959 in a more resonant acoustic then the Impromptus and don't suffer from quite the same level of intervention; he plays five of the six, dropping the fifth. The A flat major (No.2) is grave and the F minor wryly sedate whilst the concluding A flat major (No.6) is deliberate and intensely sombre. But when it comes to Sofronitsky's unevenness as a performer, especially in his last days, one can make a comparison between, say, the G flat major Impromptu in this 1960 performance and that on BMG'S 'Russian Piano School' Sofronitsky issue. Both recorded within months of each other in 1960 the BMG Impromptu has the same approach to rubato and sight subservience of the left hand in the opening paragraphs but is much more rigorously controlled, tighter and more apt. It shows just how changeable Sofronitsky could be. The Schubert-Liszt transcriptions derive from a 1960 session and are examples of his touching bravura in this repertoire. In Erlkonig there is some loss of impetus and submerged right hand detail but there's compensatory gravity in Der Doppelganger.